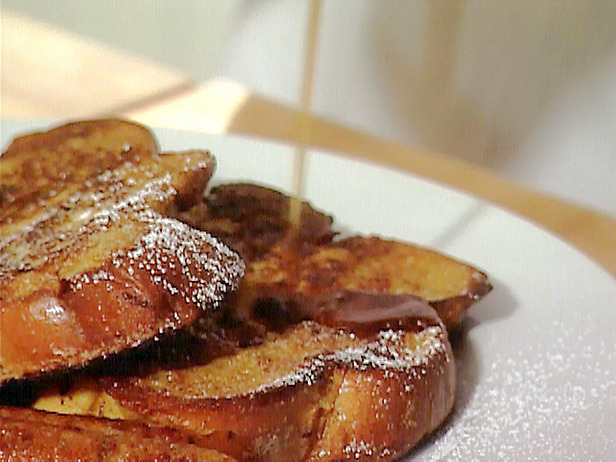 Company French toast is not only delicious, it’s a great choice for company as the recipe is prepared ahead of time. It takes about 20 minutes to prepare on Day 1 and cooks up the next morning (Day 2). As it bakes, your home will fill with the mouth-watering aroma of cinnamon and brown sugar, leaving your guests and family members marveling at your cooking finesse. * Regular bread can be used but a denser bread like the ones listed above are preferred because they can soak up the eggs/milk without falling apart. Day 1: Melt butter in 9 x 13 baking pan. Do this by placing the butter into the baking pan and turning the oven on low. Just melt the butter, be sure not to burn it. Remove pan from oven and stir in brown sugar & cinnamon. Spread butter/sugar/cinnamon mixture across the bottom of the pan. If you choose, you can instead melt the butter in the microwave, pour into the baking pan and stir in the brown sugar & cinnamon. Next, place bread slices in a double layer over the sugar/butter mixture. In a separate bowl, stir milk and beaten eggs together and pour the egg/milk mixture evenly over the bread slices. Do your best to soak all of the bread with the egg/milk mixture. Cover with plastic wrap and let stand in refrigerator overnight. Day 2: Uncover the dish and bake in preheated 325 degree oven for about 45-60 minutes. (Cook at 300 degrees if using a glass pan and add about 5-7 minutes to the cooking time) Let pan sit for about 10 minutes invert the whole pan onto a platter (larger than your baking pan); cut into squares and serve. Company French toast bakes up with a caramelized brown sugarry-goodness topping –yum yum – but it will very hot—be careful. Serve with syrup, fresh fruit, whipped cream or whatever you desire. Recipe makes approximately 6-8 servings. Or, if you have a teenaged boy in your house, 3. I serve this on Christmas morning with bacon, sausage, scrambled eggs and hash browns because we need protein & starch to balance out the sugar coma this dish induces! it is! It’s our boys’ favorite … and I enjoy a small sampling as well. A little bit goes a long ways. Cheers! love french toast. I make a raspberry compote to go on it…yum…. This does sound great. I’ve never done French Toast in the oven, we usually just do it in a pan on the stove. I’ll have to give this a try.